This beautiful orchid is endemic to Brazil where it has a very restricted range south of Rio de Janeiro growing on exposed rocks near the sea where they grow exposed to sun, spray and anything the Brazilian weather an throw at them. The species has a reputation for being a shy bloomer but the secret is to remember the natural habitat and to give plants lot of light and summer sun. We grow the species in Baskets hanging high in our Warm Americas section where we give plants plenty of water but free draining compost as we have found that roots rot quickly if the compost breaks down and goes soggy. This coerulea variety is one of the nicest ‘blue cattleyas’ we have come across – it is much bluer in reality than this picture shows. 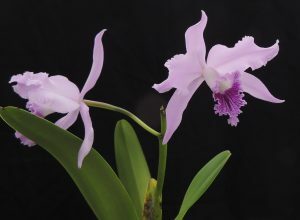 Like its close relatives Cattleya crispa and Cattleya purpurata, Cattleya lobata has spent most of its time since first description as Laelia lobata although it has little in common with the true laelias of Central America (such as Laelia anceps) We are very happy with it being a Cattleya in our collection.